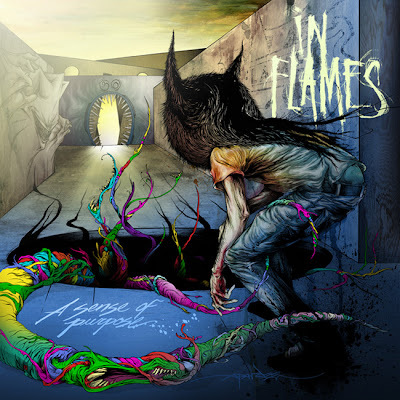 So, as i wasn't allowed to even mention this before, I have been working feverishly with one of the greatest modern metal bands in the world, IN FLAMES, on their new album artwork and packaging for their new album, "A Sense of Purpose". Those guys are not only Swedish, but they are also amazing and hilarious. Its like a heavy-metal 3-for! The cover artwork finally got revealed today. It was a very involved project, as IN FLAMES had a very specific vision for the look of this album, and i had a LOT to live up to since their last album was designed and illustrated by none other than one of my major influences, Derek Hess! Stay tuned, as we did a whole illustrated 20 page booklet to go with it. IN FLAMES' "A Sense Of Purpose" will be released in April. Check it.